This book is a collection of 44 stunning black-and-white photographs by Joel Leivick of the marble quarries and quarry workers in and around Carrara, in the province of Tuscany, in northern Italy. 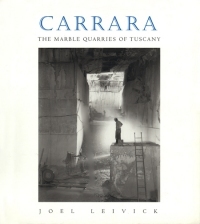 The photographs are printed as tritones, to capture their delicacy and detail, and are preceded by an introduction that describes Leivick’s goals and experiences as a photographer working at Carrara and provides a brief outline of the region’s geology and long history of marble extraction. In an Afterword, anthropologist Alison Leitch discusses the culture of quarry work and the role of landscape in historical memory.